Rose Hill School at Alderley near Wotton-under-Edge is close to completion of work on a new all-weather, multi-sports pitch. The latest development promises to bring to the independent preparatory school for children aged 2 ½ to 13, superb new sporting facilities and the opportunity to host tournaments to professional standards. 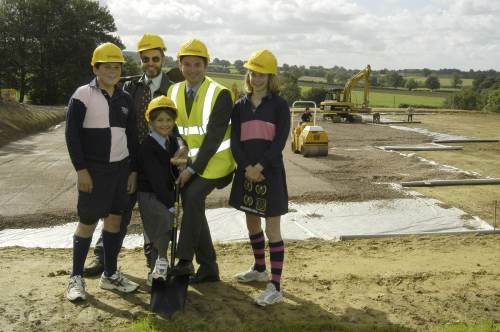 (back row from left): Edward Scott-Bowden, Peter Grimshaw of Grimshaw Kinnear Ltd, Headmaster Peter Platts-Martin and Polly Tullberg with (front) Jessica Pool. The pitch, which at 60 by 49 metres is half the size of a full adult hockey pitch, will be able to accommodate seven-a-side hockey tournaments, five-a-side football and three tennis courts to complement the school’s existing two grass courts, as well as serving other sports. In addition to hosting tournaments, the pitch will be available to pupils at weekends and it is hoped that in time the new facility will also be made available to the local community, groups and organisations. As well as incorporating the most up-to-date artificial carpet on the pitch, the School is raising funds to add the latest floodlight technology, designed to minimise light pollution. The new sports facility is due to be officially opened with a special celebration on February 5 next year. With the new pitch having been landscaped into a conservation area and set in an area of outstanding natural beauty, Rose Hill believes it now has some of the most impressive sports facilities for a school of its size in the area. "Our pupils are now able to benefit from all year round coaching, whatever the weather, on a hard court area and in a magnificent Cotswold setting," says Headmaster Peter Platts-Martin. "This is a significant investment of which we are very proud, as it underlines the School’s commitment to high sporting achievement. "I am thrilled that our pupils, who already enjoy the benefits of over six hours of physical education a week, will now have some of the very best sports provision in the county as well as quality sports coaching teachers."